When it comes to thinking about design in tech, Sony’s no newcomer. In fact, while it’s Apple which started to market the concept, Sony’s been taking this approach for quite a while. In fact, if we take a look at the history of entrepreneurship, it isn’t far fetched to claim that Steve Jobs was Sony founder, Akio Morita’s intellectual heir to some extent. Now, Sony’s made a big launch at this year’s Consumer Electronics Show. It shows how far the company has come both in terms of design and technological prowess. Take a look below to find out more. When we talk about aesthetics and design in tandem with consumer technology, no brand stands out better than Apple – at least in the modern era. But this idea of a holistic product, one that doesn’t simply mesh together features, but rather delivers on expanding a user’s potential, isn’t an Apple exclusive. Sony founder Akio Morita was a staunch believer in the concept before Steve Jobs came along. And the pair’s close relationship isn’t an open secret either. True to form, Sony’s back at this year’s CES with another amazing, ludicrously priced projector. The LSPX-A1 can project an image that’s as much as 120 inches wide, from a 9.6 inch distance. If you’re a fan of projectors, this distance is nothing. The device also reaches a peak brightness of 2500 lumens. But these aren’t the details which justify a $30K price tag. 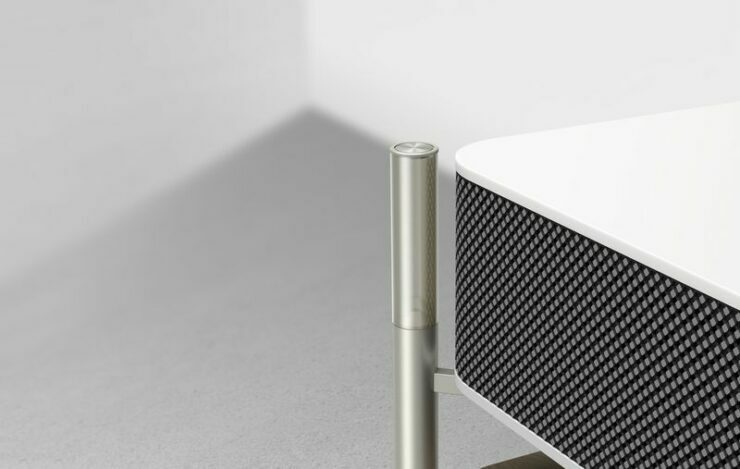 The projector also features a Glass Sound Speaker, intended to generate 360 degree audio. This has a separate sub-woofer, two glass tweeter on the front legs and three midrange speakers. Actuators vibrate the organic glass to generate audio. Now, let’s move to design. The top of the projector is artificial marble, the frame is aluminum and the bottom is a wooden shelf. So, not only is it a projector, but you can also use it for decorative purposes. These details allow the LSPX-A1 to blend in seamlessly with its curated environment. Speaking of environment, Sony adds that the projector can also reproduce detailed pictures and atmospheric sounds to create a sense of movement. All for a cool $30K. Thoughts? Let us know what you think in the comments section below and stay tuned. We’ll keep you updated on the latest.